The past few days I have been crocheting. Years ago I made a few blankets, nothing fancy and learned to make 3 flowers. Now with all the videos on YouTube it sure makes learning MUCH more easy. Naturally it is Red, since that is my favorite color. I was shocked when I was able to make it 5 1/2 hours. Using the Cobble yarn really made it go fast. Melanie from IHeartStitching has some great videos for anyone's level. Very easy to follow along with. Even a beginner like me had no problems making this scarf. 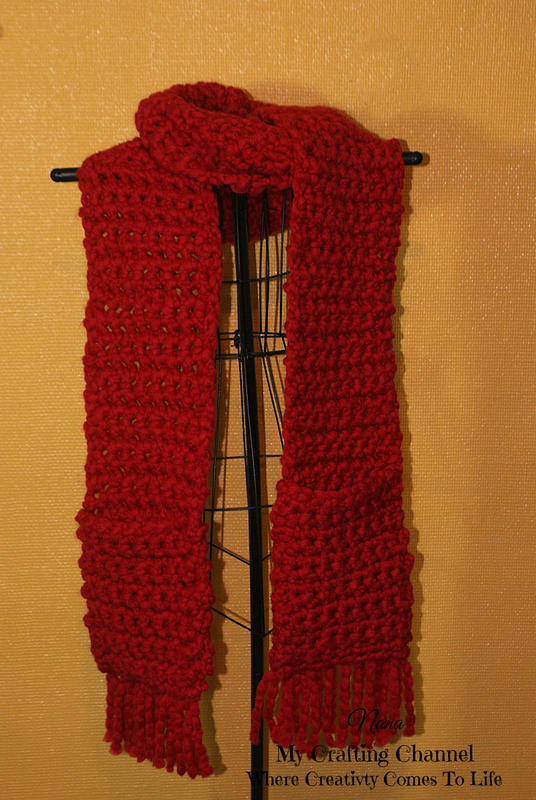 I do have another scarf that will be posting Friday or Saturday. It to is a IHeartStitching design. Can't post it until the recipient receives it. Don't want to spoil the surprise. I really LOVE this scarf. What a beautiful scarf!!! You did a awesome job!!! Have a great day. Nana, this is beautiful! Wow, what a wonderful gift for someone! GREAT job! Love it! You did a wonderful job on this beautiful scarf! Love it! Wonderful scarf, love that you have given it pockets. fabulous. What a fabulous job you made of this, I love that it has those little pockets in the ends and the lovely fringe. How fabulous is this?! LOVE the pockets and that deep red color...awesome! It is something I have always wanted to learn how to do and just can't master it! This is so so beautiful! This is really Beautiful! You did an AWESOME job my friend!! very cool! I never thought to do pockets, but they are awesome! a beautiful scarf, thank you for the inspiration.